If you love the look of marble counter tops you’re not alone. Marble counter tops have an elegance and a brightness to them that is hard to duplicate. They look gorgeous in design magazines and on Instagram posts. But for most families marble counter tops are just not durable enough to stand up to everyday use. Marble gets stained and etched very easily. Everyday cooking, along with the damage that can be caused by kids makes marble an impractical choice for most family homes. You can however get the same brightness and elegant look from marbled quartz counter tops which are much more durable. Marbled quartz has the same veining and look of marble but it won’t etch or stain and can stand up to everyday living. 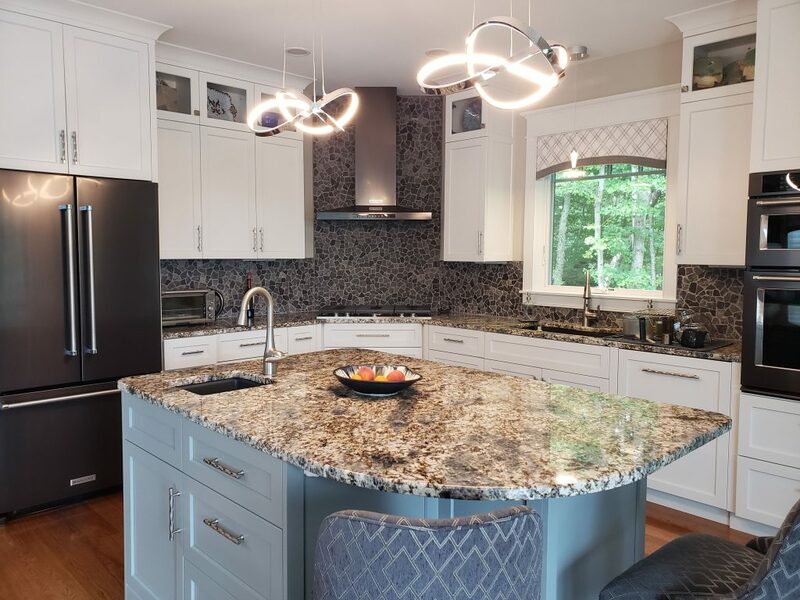 Marbled quartz is the perfect counter top material for homeowners that want their kitchens to be beautiful and functional for the whole family. Reclaimed wood is one of the strongest trends in kitchen design this year. There are a lot of reasons why homeowners and designers can’t enough of this versatile material. Reclaimed wood is environmentally friendly, relatively inexpensive, and it can be used in creative ways all over the home including the kitchen. In fact, reclaimed wood is a fantastic material to use in the kitchen if you have one of those pristine white builder kitchens that have been the standard in new construction homes for the last five years or so. You can use reclaimed wood to inject some personality and warmth into that sterile kitchen by using reclaimed wood for gorgeous floors, new counter tops, and/or rustic shelving. Wood accents add a lot of charm and can soften the harshness of an all-white kitchen that can be seen as a little clinical. Using reclaimed wood will make your kitchen a more family friendly place to gather so that your friends and family will want to spend time in the kitchen with you. Adding a breakfast nook is a fantastic way to upgrade the functionality of your kitchen as well as, the design of your kitchen. A small breakfast nook is the perfect place for you and to enjoy a coffee in the morning before starting your busy day. It’s also the perfect place for small children to eat. Containing the mess that they’re sure to make. Older kids can use the nook for arts and craft projects. You don’t have to worry about them marking up the carpets in the family room. Adding an island in a small kitchen can double your prep space. It can give people a space to hang out in the kitchen. In an open concept kitchen, a kitchen island is a must. Family and friends have a central point where they can gather. When you’re cooking, having an island will make preparing and serving a lot easier. A large island with a multi-purpose counter top is the perfect place for kids to do their homework or have a snack. The cabinets take up most of the space in your kitchen. Therefore, when you’re not happy with the cabinet color the entire kitchen can seem drab and dreary. Changing the color of your cabinets is an easy way to turn the kitchen you have into the kitchen that you want. For years designers have been using light or white colored cabinets in the kitchen but that is changing. Colored kitchen cabinets are coming into style in a big way. Bright colors, dark colors, even two toned colors are all fantastic trends you can take advantage of. For a really great look pick out two shades of one color and paint the upper cabinets one shade and the lower cabinets another shade. Make sure you use the same new hardware on all the cabinets to tie the look together. Another way to make a dramatic change in the look of your kitchen is upgrade your flooring. Get rid of the tile and replace it with some sturdy but good looking laminate flooring or go for real hardwood floors. Wood floors are elegant and stylish. But if you opt for real wood choose engineered wood floors. They have the beauty and rich colors of real hardwood but are also engineered to be more durable. They will last in high traffic areas like the kitchen. Changing the lighting in your kitchen is an easy way to upgrade the look of your kitchen. 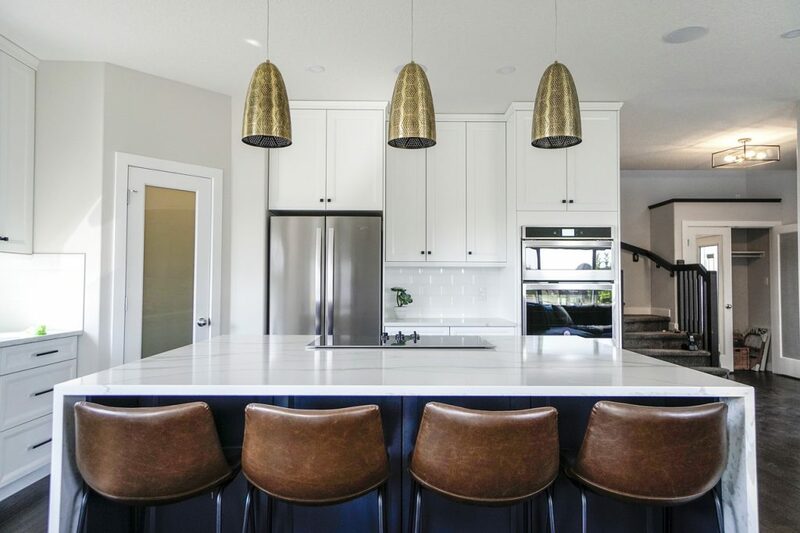 Choose some fun new light fixtures in warm metals like bronze, copper, and gold to keep your lighting on trend. 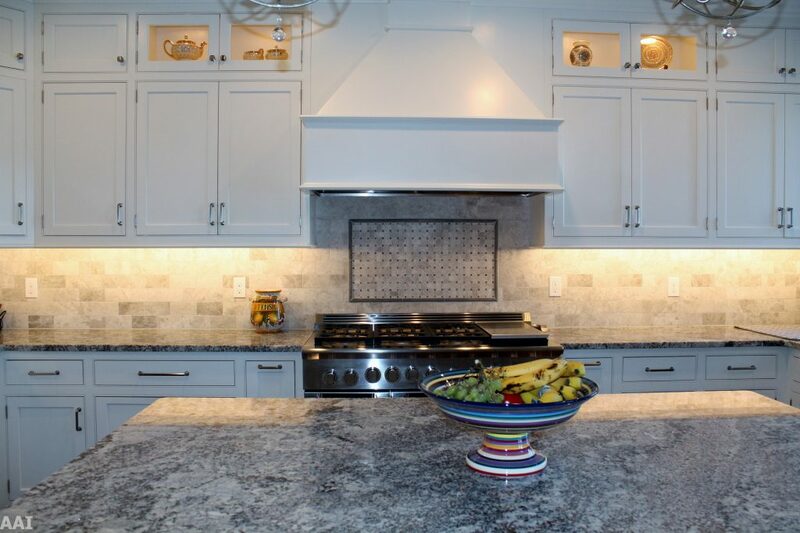 Add some under cabinet lighting as well to make your kitchen function better and look brighter and more inviting.